← THE DEAN’S LIST: NOW THAT PEYTON IS GONE, WHERE IS MY ALLEGIANCE? Tipton junior Mike Crawford drives the lane for two of his 40 points against Bowman Academy in the Class 2A Lafayette Semi-State. LAFAYETTE – Relentless. Dogging. Suffocating. Those are but a few of the terms being thrown around the Crawley Center when describing the Bowman Academy defense against Tipton in the Class 2A North Semi-State at Lafayette Jefferson High School Saturday evening. And if one listened close enough, they heard terms like gallant, gutty and courageous to describe the Blue Devils efforts. But in the end, it was the suffocating defense and physical prowess that sent Bowman to next weekends Class 2A state championship game after downing Tipton in a 69-64 thriller. From the opening tip, Gary’s Thea Bowman Leadership Academy threw a full-court press at the Blue Devils. While Tipton struggled, they managed to bring the ball up the court and hold a 13-11 lead after one quarter thanks to 10 points from junior Mike Crawford. But a 27-14 Bowman second quarter run was simply too much for the Blue Devils to overcome in the end – but they sure tried as Indiana Junior All-Star candidate Mike Crawford led a charge that put a scare in the Eagles. Dickey was referring to Tipton being outrebounded 46-37, resulting in 13 second chance points for the Eagles. After Bowman scored the first basket out of the halftime break to take a 40-27 lead – and looked like they would run away with the game – Crawford and the Devils started a comeback with a 21-17 run. With momentum clearly returning to Tipton, Crawford drove the lane and was fouled hard by Antonio Pipkins at the 6:06 mark of the fourth quarter. As Crawford was on the ground, Pipkins stood over Crawford and taunted him, resulting in a technical foul. The Blue Devil junior guard hit all four free throws to cut the lead to five. With Tipton keeping the ball as a result of the technical, they worked the ball and found Crawford, who hit another jumper to trim the Eagles lead to 57-54 with 4:45 left in the game. Despite a heroic 21-point second-half by Crawford and with the Tipton crowd in a frenzy – they outnumbered the Bowman fans three to one – Tipton ran out of gas against a more-physical Bowman team and could get no closer than three points down the stretch. Crawford finished the game with 40 points and eight rebounds. 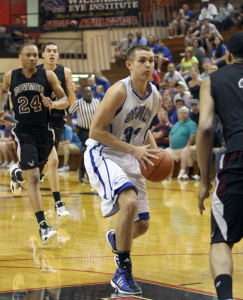 Those who were in attendance knew that Tipton had the best, and gutsiest, player on the floor. He slashed, drove and pulled up on shot after shot. He hit 14 of his 24 attempts and nailed 12 of 15 free throws after averaging 22 points this season. Tipton finished the season 24-4 and picked up sectional, regional and Hoosier Conference championship hardware.